Finding the right fundraising consultant for your nonprofit can sometimes be a challenge. Your team needs to pick a partner who understands your organization’s mission and vision for your future, while also choosing a firm that fits within your budget and provides the right ROI. 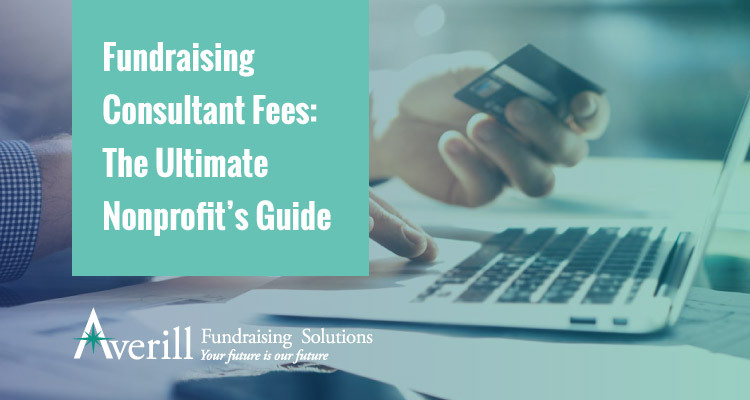 Even though fundraising consultants are often a key part of your operations, it might come as a surprise that many nonprofit professionals are in the dark about the costs associated with hiring a fundraising consultant, what these fees pay for, and other financial details. Before your team starts planning your next big fundraising campaign or overhauling your strategy, take some time to brush up on how much hiring a fundraising consultant will cost. Remember, with the right partner, this investment can revitalize your organization! 1. How are fundraising consultants compensated? 2. How much will it cost to hire a fundraising consultant? 3. Are there additional costs associated with hiring a fundraising consultant? Is your nonprofit ready to learn the ins and outs of hiring a fundraising consultant? Let’s dive into your questions! When first searching for information on fundraising consultant fees, the question many individuals wonder about is exactly how fundraising consultants are compensated. The answer is a little complicated. The fact is that depending on the fundraising consulting firm’s practices and the services they provide, compensation styles vary greatly. However, there are a core few methods of compensation that most fundraising consultants use. Agreeing to a flat fee. One way to compensate your fundraising consultant is by paying them a flat fee agreed upon at the start of your engagement. This fee structure works well when a partnership is intended to accomplish a specific task (like developing a case statement) or has a short-term end date. Keeping them on retainer. Typically, this method is used for long-term fundraising campaigns (like a capital campaign or annual fundraiser) that may have a flexible or undetermined end date. Fundraising consultants on retainer often provide in-depth services that require an ongoing relationship and time invested before seeing results. These compensation methods are typically your best best when it comes to increasing your fundraising ROI. When the cost of the engagement is agreed upon before you begin your partnership, you can ensure that the consultant won’t artificially inflate their fees or waste billable time. In other instances, firms charge a percentage of the money you raise over the course of the campaign as their payment. These partnerships aren’t preferable and can often be a “quick fix” solution to fundraising challenges that require more direct attention. Even worse, partnerships with these kinds of firms often end up costing more in the long run and eat into your fundraising progress. Depending on the kind of compensation agreement your nonprofit and fundraising consultant can come to, you can always expect to sign a contract before your engagement begins. These contracts protect both your organization and your fundraising consultant partner. In them, you will set goals for different fundraising metrics that must be met as part of your terms, financial incentives for reaching these goals, and even penalties for not performing up to expectations. 2. What affects the cost of a hiring a fundraising consultant? When your nonprofit decides which fundraising consultant you want to be your partner, the next thing you’ll need to determine is how much their services will actually cost. Much like determining how you’ll compensate them, this process is dependent on a few key factors. Particularly, the cost of hiring a fundraising consultant can vary depending on the type of project they take on, the nature of your nonprofit, and the prestige of the consulting firm. In this section we’ll go over each factor and review how it might impact your fundraising consultant fees. Fundraising consultants can provide a variety of key services to your nonprofit. Depending on your fundraising goals, your team might opt for a large-scale partnership or a short-term engagement. Nonprofit education services like professional development classes, lectures, and staff training. Campaign pre-planning services like an à la carte fundraising feasibility study or ironing out your case statement. Fundraising campaign direction in which you position the consultant as a leader of your next campaign to help see you through to your goals. It stands to reason that you get what you pay for, so don’t be surprised if more intense fundraising consultant services require a larger investment. In the long run, it will definitely be worth it for your nonprofit! Another major factor that can influence the cost of hiring a fundraising consultant is the nature of your nonprofit. You’ll want to find a partner who actually understands who you are as a team. Your nonprofit’s mission. Who does your organization serve, and how well does the fundraising consultant understand your cause? Your nonprofit’s culture. This refers to the internal culture among staff, volunteers, board members, and other stakeholders. Your consultant should fit in well with your team. Your nonprofit’s fundraising experience. Younger organizations have different needs than more established ones, and your consultant should take this into account. Fundraising consultants come in all shapes and sizes, just like nonprofits. For this reason, you’ll want to take the time to find the best-fit consultant for your individual organization. This might mean paying a little extra for the perfect partner. Like any other business, fundraising consulting firms work hard for their reputations among the nonprofit community. However, not all firms carry the same clout. Their experience working with nonprofits of a similar scale, mission and constituency as yours. They should be well-versed in what your nonprofit is trying to achieve. The diversity of their clientele in the past. You want to choose a firm who has worked with nonprofits like yours, but you also want to know they’re ready to take on curveballs. Whether or not they can provide dependable references. Be sure to ask around with your nonprofit peers and learn their impressions of the firm’s work. While you might think that prestigious fundraising consultancy firms will always be out of your price range, many excellent firms offer affordable services that fit in with your nonprofit’s budget. Don’t feel like your team needs to settle for anything less than a perfect partner. Quite often, one of the most pressing questions nonprofits ask about hiring a fundraising consultant concerns miscellaneous costs associated with the process. Organizations often wonder where additional expenses will arise, how to navigate these costs, and what investments are truly necessary to get the most out of your partnership with a fundraising consultant. If your fundraising consultant takes your nonprofit seriously, they’ll never mislead you or unnecessarily inflate your bill. However, it’s quite likely that over the course of your partnership with a consultant that you’ll need to make an additional investment or two. After all, nonprofit fundraising can be unpredictable! Your team may realize you need specialized services or extra attention from your consultant that wasn’t accounted for in your original price quote. Travel expenses. In general, travel expenses will be included in your initial compensation agreement. However, if plans change and you need your consultant to meet your team at its headquarters in a hurry, expect to compensate them for their travel, especially for unplanned trips. Ad hoc projects. If your nonprofit has signed a fixed agreement with a consultant that only covers one particular service or project, you may find that when additional ad hoc projects occur you’ll need to adjust your compensation to reflect these efforts. These could include developing prospect lists, producing campaign collateral, and more. Internal investments. Your partnership with your fundraising consultant should result in changes in your fundraising strategy and positive action on behalf of your team, so you’ll likely need to make internal investments on top of hiring your fundraising consultant. This might comprise hiring new staff, training current team members, or investing in software. Capacity building. When your nonprofit hires a fundraising consultant, you may work with them on capacity building efforts to prepare your team to achieve its fundraising goals. These efforts will take time, additional investments, and possibly an expanded partnership with your consultant. While knowing your partnership with a fundraising consultant could likely result in additional expenses outside of their initial services can put nonprofits on edge, it will be worth it when all is said and done! Ultimately, these expenses are investments in the long-term success of your organization and will result in more effective operations. Hiring a fundraising consultant can often be a daunting process, especially when it comes to finalizing this investment. Now that you have the answers to these key questions, you’re ready to find the best-fit fundraising consultant for your nonprofit! Double the Donation’s 13 Top Fundraising Consultants. Ready to reach out to an expert nonprofit consultant? Visit Double the Donation to learn their favorite fundraising consultants. Averill is ranked #1 on their list! Create a Comprehensive Capital Campaign Plan. When it’s time to plan your next capital campaign, consider hiring a capital campaign consultant! 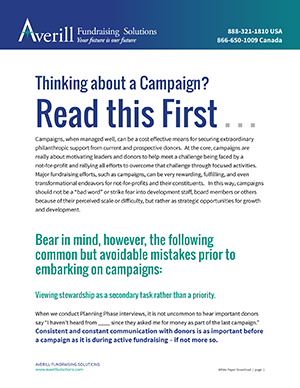 Take a look at our 5 best tips for planning a capital campaign. 7 Prospect Research Resources for Major Gift Fundraising. Your nonprofit might partner with a fundraising consultant to identify major gift prospects. Learn more about researching these important prospective givers with our guide.